SOH4 - Safety Orange S-Hook 4"
Safety Orange S-Hook with 1-1/2" Openings with Yellow end caps. 4" Long. High visibility hook. 50# capacity. Made in USA. SOH6 - Safety Orange S-Hook 6"
Safety Orange S-Hook with 1-1/2" Openings with Yellow end caps. 6" Long. High visibility hook. 50# capacity. Made in USA. SOH12 - Safety Orange S-Hook 12"
Safety Orange S-Hook with 1-1/2" Openings with Yellow end caps. 12" Long. High visibility hook. 50# capacity. Made in USA. 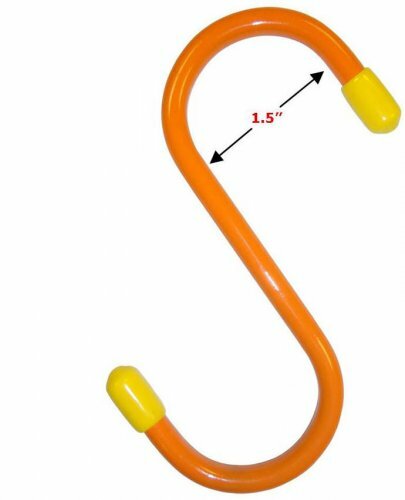 SOH18 - Safety Orange S-Hook 18"
Safety Orange S-Hook with 1-1/2" Openings with Yellow end caps. 18" Long. High visibility hook. 50# capacity. Made in USA.